to guarantee you get a comprehensive pest management guide, meal, and other resources. See programs for each site. How can you control glyphosate-resistant weeds? What can you do to delay corn rootworm resistance on your farm? Where is the safety in the farm income safety net? What are the truths and the legends of cover crops? How can you employ climate-resilient irrigation systems? These are among the many topics to be covered at the 2016 Nebraska Extension Crop Production Clinics this January. These one-day workshops will be held at nine sites, each featuring location-specific topics as well as timely research updates and recommendations for any farm. Pesticide applicator recertification for private applicators and for commercial/noncommercial ag plant, demonstration/research, and regulatory will also be available. The clinics provide “high impact training for agricultural professionals and producers,” said Amit Jhala, program coordinator and Nebraska Extension weed scientist. 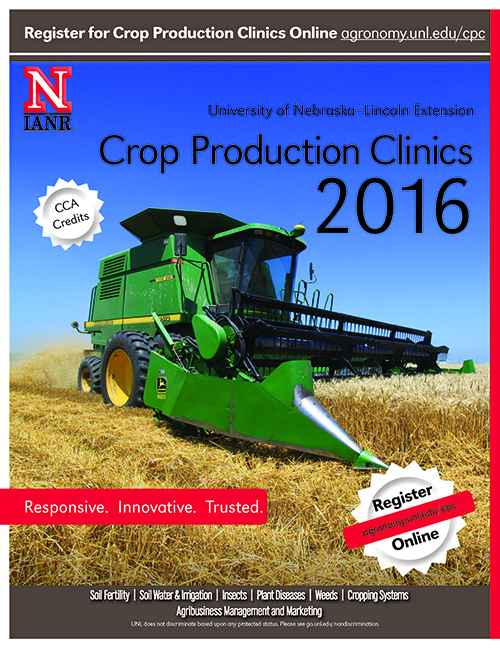 All programs start at 8:45 a.m. and end at 4 p.m.
A meal and resource materials, including the 2016 Guide for Weed Management in Nebraska and the CPC Proceedings, will be available to those who preregister at agronomy.unl.edu/cpc. Preregistration is $65 or registration is $80 at the door. Preregistration closes 3 p.m. the day before the clinic. Wednesday, Jan. 6 — Gering Civic Center, 1050 M St.
A maximum of six CCA credits will be provided per day in the areas of crop production (2), nutrient management (1), integrated pest management (6), water management (1), or professional development (2). For more information, go to agronomy.unl.edu/cpc, see the program flyer, or call 402-472-5636. Online preregistration is currently available on the website and program information by site will be added soon.